Discussion in 'JS Plugin Releases (RMMV)' started by mjshi, Jun 23, 2017. A fancy radar chart for your stats! Commissioned by the wonderful Lonewulf123 of these very forums. 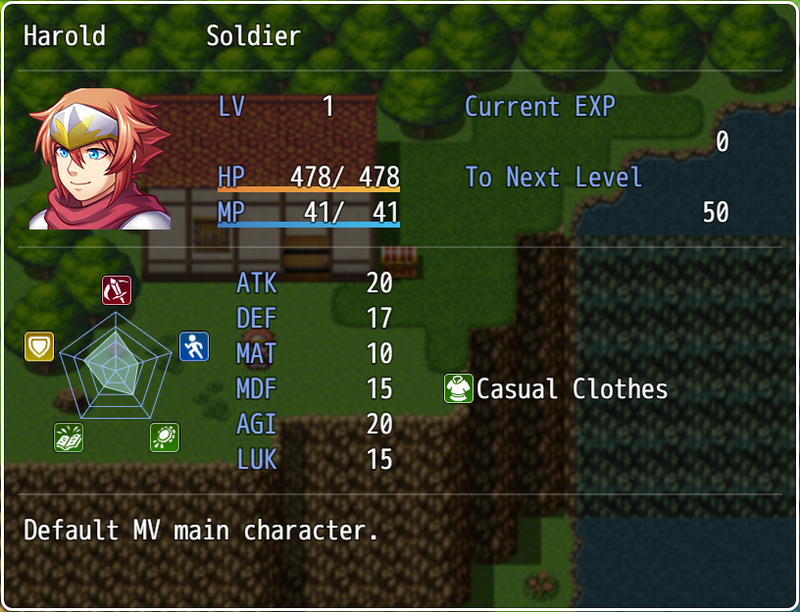 - Customize which and how many stats to show! - Change the colors as you like-- just be sure to use hex color codes! Archeia, Chainer07, Eliaquim and 17 others like this. Thank you for taking on my request! It's awesome and works perfectly for me! Just in case you can't download remember to login in your dropbox account. Beautiful idea !!! You can do that figure in the middle ... blinking ??? @mjshi Is there any way I can replace the bars in Yanfly's Status Menu core? I would like to remove the bars and have just this polygon to represent my statistics to my players. Or maybe even call this in a separate window or with a separate menu command? and delete everything from this.changeTextColor(this.systemColor()); to this.drawText(text, dx, dy, dw2 - 4, 'right')... all the way to the closing brace } (lines 248 to 262). Johnboy and Lonewulf123 like this. @mjshi Awesome. Thanks a bunch. You've come to the right place, but you'll need to be more specific with the issue you have. What other scripts are you using? Did you try in a fresh project? @MORINGA This plugin is compatible with Status Menu Core. Make sure to read the help file! If it isn't showing up your Center X and Center Y values probably need to be adjusted. Visually I much prefer this way of showing information compared to just having a list of stats and numbers. The list of stats and numbers window appears in other places such as the equip screen and status screen. Is there any way in which this Stat Polygon can just replace that entirely? 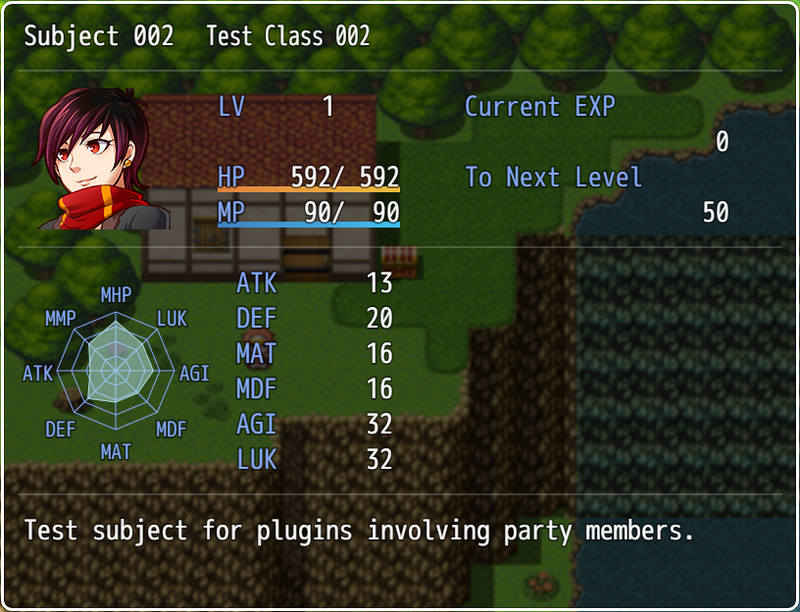 So when other plugins/scenes want to show that list of stats, the Stat Polygon would be there instead of the list. TL;DR No more list, only Polygon. Do you mean to have two different stat polygons in the equip/status screen that show the changes? so if you copy/pasted that to other windows you could have stat polygons there also. However, if you wanted to make two stat polygons side by side you'd have to move the x and y coordinates around a bit and to show the changes rather than this._actor use this._tempActor for the second stat polygon. But otherwise, there's no built in function for that. so I believe it was the 'this.contents.SPolyDrawStatPolygon(this._actor);' part that I was after! @Harken_W No problem! Also, if you want to make that polygon anywhere else but also have the icons/text etc just copy/paste the relevant portions later on labelled "//draw icon" and "//draw text", respectively. This way when you call this.contents.SPolyDrawStatPolygon(this._actor); you can also specify a center x and y coordinate. to center it at x=100 and y=200. This is so simple yet so awesome and helps to show players information in a way that lets them immediately distinguish strengths and weaknesses. This would be awesome for element resistances etc. too! I do seem to have a problem. Showing the stats on level 1 seems just fine, but as soon as I test it with their initial level being something like 20, all the graphs are completely maxed out. Do I do something wrong or does the graph not "grow" with the stats? It should probably always be a relative value. You have to adjust the “max stats” value in the plugin parameters I believe. You can’t change the maximum value dynamically with each level. @Zack Phoenix It's just as Lonewulf123 said. The default "max stat" values are set intentionally low, so that differences in stats are immediately obvious the second you enable the plugin. However, for it to be useful realistically, you're going to have to decide what approximate upper maximum the stats in your game are going to have. Change what the bolded text is. This value should go from 0 to 1 (so 0 to 100% of the polygon). Currently it's based on the percentage created from the actor's current stats divided by the approximate maximum stat.